How to choose a pediatrician for newborn? Paediatrics, sometimes spelled as pediatrics, is a branch of medicine which deals with medical care of new-born babies and children, up to the age of adolescence. The experts in adult medicine are not qualified to deal with infants and children, because, the small body of an infant is considerably different from the body of the grown-ups. The body of a child which is at a growing state behaves somewhat differently from that of an adult and accordingly, its needs are different too. For example, oncology, immunology and a host of other areas fall under the specialized area of paediatrics. A paediatrician is a doctor who has specialisation to care for your baby. The importance of choosing the right doctor for your baby can not be over emphasized. It will be an important decision you will make for your baby for its health and well-being. The paediatrician will care for your child beginning from its birth till it grows up, providing all the necessary care for its health including immunizations. Paediatricians also help the parents to deal with issues such as the physical and mental growth and development of the baby, and also with the illness and injuries that are sure to come as the child grows up. Hence it is very vital to find a specialized doctor at an appropriate time. 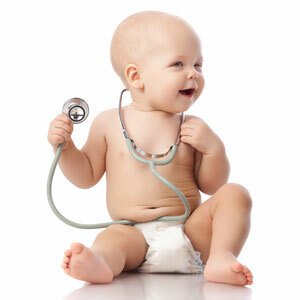 The paediatricians are skilled to treat an wide range of illness. They are qualified to treat even some of the serious ailments. There are certain paediatricians that have acquired additional training in the complex areas like child cardiology, neonatal care and so on. In case your child suffers from a complex disease, your regular child-specialist will assist you in finding a specialist pediatrician in that area to cure your child. Now the question is, what would be the appropriate time? The thing to ponder is that, the moment your baby is born, the physician or gynecologist is theoretically no longer responsible for your child. You need a child-specialist for that. So, ponder well before choosing a paediatrician for your baby. This will be the person you will be seeing quite frequently with your baby for well-baby care and in case if some unprecedented ailments, sickness or emergency. This is an important part of raising your baby. There are many aspects to consider. First, your paediatrician should be someone whom you and your baby can like and trust. He or she should have a pleasant personality to which your baby responds well. Second, you need to consider the degrees, qualification and the training of the paediatrician. He must be qualified and experienced as well to treat your child. Third, you need to consider about the location of his chamber. It must be conveniently located, preferably near your residence, so that you may rush to him in case of an emergency. Fourth, you should also be aware of the stipulated hours when he will be available in his chamber. You need to discuss with him, whether he would be available for consultation in the odd hours in case of an emergency. You should also know, whether he would be available on the weekends. It is also important to know whether your paediatrician is associated with a nursing home or hospital nearby, which is compatible with your insurance plan. It is also important to take in to consideration how long you and your child will have to wait in the chamber when you go to see him. Will an advance appointment make any difference? It will be especially important, if your child happen to become very sick. You should also consider about the cleanliness of paediatrician’s office or the friendliness of the staffs, in case he has an assistant or receptionists working for him. Finding a qualified child-specialist for your baby is not very difficult. But when you choose a paediatrician for your child, you should be well informed about him before going for a visit. You should not ideally select him from the lists of the yellow pages directory, or from the advertisement in a newspaper. You can ask your gynecologistor the physician looking after you at the time of your delivery to refer somebody. You can also talk with other parents in your neighbourhoods about their paediatricians. You can also talk with your friends, relatives and colleagues to find out their experiences and recommendations. Nevertheless, it is very important to pick the right one, because, it is you and your paediatrician who are going to make the vital decisions about your child’s health. These decisions are decisions about vaccinations, use of antibiotics and feeding of your baby. This is going to have a lasting impact in your baby’s life. Notice, how your child responds to the paediatrician. Notice, whether the paediatrician welcomes your question, in case you have a doubt. Observe, if he naturally enjoys working with children, or is he glum faced. Observe whether he has the time to discuss the problem or listen to you. If you find that your child does not respond well to the doctor or the paediatrician does not have enough time to explain the problem or attend to your concerns, decide to move to another paediatrician who addresses the problem well. If either the parents or the child is uncomfortable with something about the paediatrician, it is not an wise course of action to continue with him. At the best interest of the child, they should feel free to evaluate the other paediatricians and decide the one to switch to.